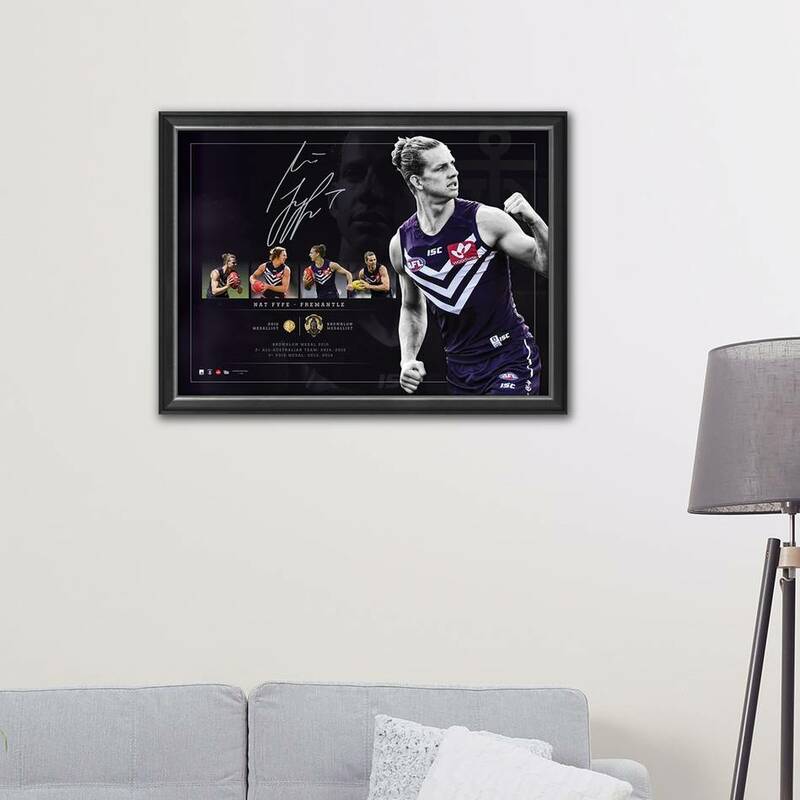 Freo’s favourite son, Nat Fyfe sits as one of the more unique players in the history of the game. His incredible range of skills are unrivalled by any other. Too agile for key position players, too strong for midfielders, and dynamic in the air – there isn’t a match-up in which Fyfe doesn’t thrive. In his prime, you can arguably class him as completely unstoppable, a class shared by very few. He has been described as nothing short of fearful by opposition coaches – his ability to switch into beast mode seemingly at will foretells a frightening proposition for rival clubs. After an interrupted time with injuries, Fyfe is out to prove a point to those who may have forgotten just dominant he can be. 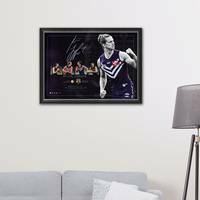 Official Memorabilia, in conjunction with The Fremantle Football Club and the AFL, are proud to release the Nat Fyfe signed Lithograph. 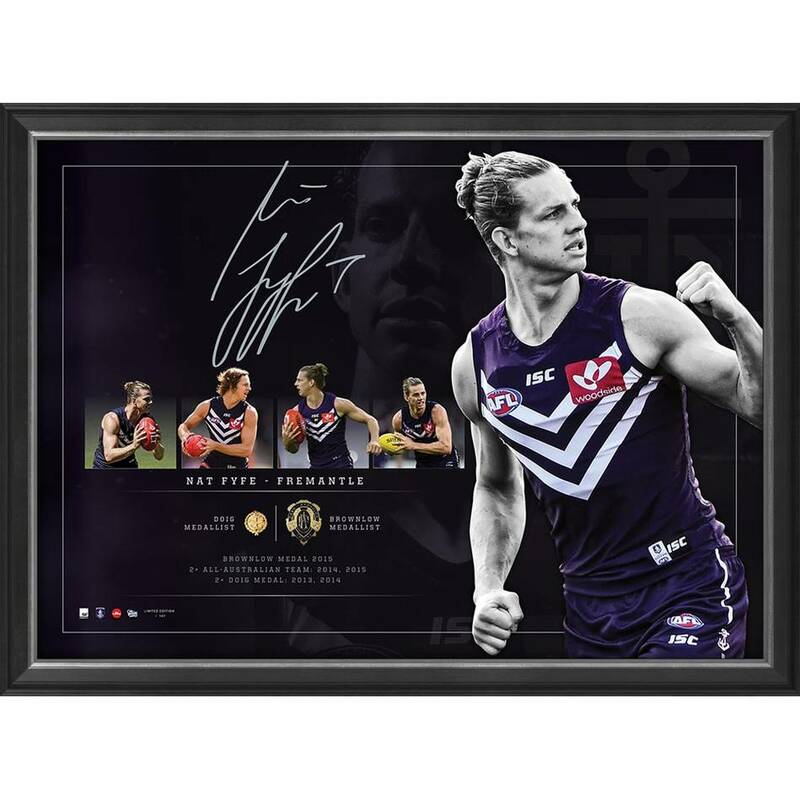 Paying tribute to Nat Fyfe’s decorated career, this beautifully presented piece comes personally signed by Fyfe, is officially licensed by the AFL and endorsed by the AFLPA. With just 107 editions available worldwide, this limited quantity won't last long - secure yours before they run out.